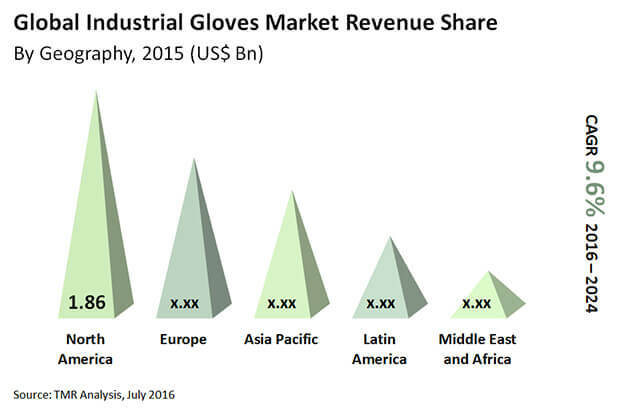 The global industrial gloves market is highly consolidated with the top four players accounting for over 75% of the market in 2015. These top companies are: Honeywell Safety Products, Showa Group, 3M Corporation, and Ansell Ltd. Leading players have a constant fight to reach the top spot, intensifying the competition level in the industrial gloves market. Players in the market are taking efforts to develop new, innovative products. Players are also striving to reduce product cost while also maintaining the quality of products. Mergers and acquisitions are increasingly observed in order to enhance and expand the product portfolio and acquiring the trust of consumers, states Transparency Market Research (TMR) in a recent report. According to TMR, the global opportunity in the industrial gloves market will rise from US$5.13 bn in 2015 to a valuation of US$11.01 bn by 2024, expanding at a CAGR of 9.6% from 2016 to 2024. On the basis of product, the disposable gloves segment accounted for over 85% share in the market in 2016. The disposable gloves segment shall continue to enjoy highest demand in the coming years and expand at the highest CAGR of 9.7% from 2016 to 2024. By application, the pharmaceutical industry segment held key shares and accounted for over 25.5% in 2015. However, it is the food industry, which is expected to emerge as the most promising segment in the future, with increased focus on hygiene across food industry operations. The demand for industrial gloves will witness a rise in the developing nations where the food industry is growing, and this will lead to the segment witnessing the fastest CAGR of 10.2% from 2016 to 2024. On the basis of geography, North America and Europe collectively accounted for 60% of the market in 2015, says a TMR analyst. The high growth of the pharmaceutical and chemical industries and strict regulatory mandates have fueled the demand for industrial gloves in these regions. The increased concerns for worker safety are another factor behind the high demand for industrial gloves in Europe and North America. The fastest growth in the industrial gloves market is expected in Asia Pacific owing to the implementation of strict regulations regarding worker safety in hazardous environments. There are untapped opportunities in this region, which will drive the growth of the market in the future. Industrial gloves are in demand from across chemicals, pharmaceuticals, food, and healthcare industries. Of these, two third of the global industrial gloves market’s revenue came from chemicals, food, and pharmaceutical industries in 2015. Thus, the growth of these aforementioned industries is a primary requisite for the overall increase in demand for industrial gloves. Fortunately for the industrial glove market, these end use industries are thriving across all regions such as Asia Pacific, Europe, and North America. In addition to this, government and other private bodies are also playing an important role in boosting the demand for these gloves by mandating worker safety. Worker safety is taken seriously, especially in developed nations. Also, hygiene is another concern why industrial gloves are being encouraged in the food industry especially. On the flip side, large players are experiencing a threat from cheap varieties of gloves manufactured by local companies in developing nations.